CONCORD, N.C. (AP) — Jimmie Johnson stood outside of his banged up No. 48 Chevrolet still in disbelief over the blunder he’d made on the final lap Sunday’ at Charlotte Motor Speedway that cost him a shot at advancing in the playoffs. “Shell-shocked,” said the seven-time Cup champion. Johnson had all but secured a spot in the round of 12 with a strong showing through 108 laps. Sitting in second place, all he had to do was follow race leader Martin Truex Jr. to the finish line. 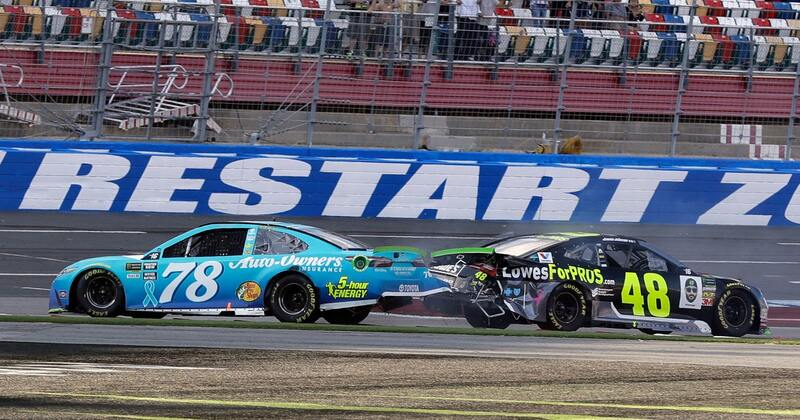 Instead, Johnson made the split-second decision to go for the win, attempting a pass Truex Jr. with two turns remaining on the new “roval” track. Johnson tried to go inside, but instead ran into Truex, causing a crash that cost Truex the win and knocked himself out of the playoffs. Ryan Blaney passed both drivers for the win. Truex deliberately spun out Johnson’s car after the race and was still irritated at him when he spoke about the attempted pass. Johnson didn’t hide the fact that he wanted to end a frustrating career-long 58-race winless streak. Before he made the decision to pass, Johnson said he never thought about the chance of missing out on the playoffs, feeling he was safely in. Instead, Johnson finished in a three-way tie with Kyle Larson and Aric Almirola for the 12th and final spot in the standings. He failed to advance on a tie-breaker. “It’s a bummer and it is not what we want by any stretch,” Johnson said. Charlotte Motor Speedway President Marcus Smith said the race lived up to the hype.